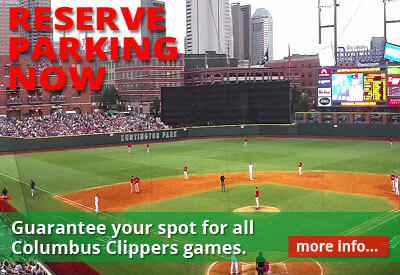 Guaranteed parking is available for all Columbus Clippers games at Huntington Park. To reserve a parking spot, click here. Huntington Park is home of the Columbus Clippers, the Triple-A affiliate of MLB's Cleveland Indians. The stadium opened in 2009 to replace the Clippers' former home, Cooper Stadium, and was voted that year as "Ballpark of the Year" by Baseballparks.com, beating out other newly built or renovated stadiums, including such Major League parks as the new Yankee Stadium and Citi Field. The ballpark is popular among fans for its superior design, attractive site, and fan amenities. It is located at the corner of Neil Avenue and Nationwide Boulevard in the Arena District of Columbus, and is near many popular attractions including Nationwide Arena, Lifestyle Communities Pavilion, and Arena Grand Theatre.